It is said that there was a time when 35th Rastriya Rifles used to give ‘cash for corpses incentive scheme’ to its battalion members, through which even innocents have been killed, because no one was asked who the gunman fired. Today, India claims itself to be the world’s largest democracy. It takes pride in its written constitution, its secularity, the promised reforms to economic prosperity, but acts as a rogue state when nationalism becomes a preferred doctrine to subdue the oppressed craving for liberation - it holds true for the poor working class of farmers, the tribals, who with the result of impoverished poverty have waged a war through guerilla warfare against the Indian army, in distant lands where economic development, education and a happy life seems as a distant dream. It also holds true for the Kashmiri masses, who have been entangled in a cyclical form of totalitarianism through force after each mass protest. 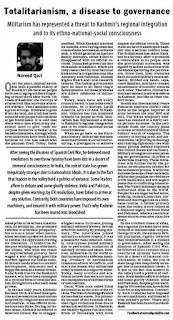 In the last sixty years, Kashmir has seen birth of armed insurgencies and secessionist institutions inspired by religious and secular nationalism. It has seen in numerous martyrdoms of youth whose blood has been spilled through Palestinian Arab inspired resistance of stones – The new eastern intifadah. During turbulent times, Kashmir is reduced to deserted streets due to exaggerated fear. When Kashmir is locked for months, even buying essential commodities becomes an arduous task. A whole generation has lost family members, either killed or disappeared with no official records. Unmarked graves run into thousands in Kashmir, which are only researched by international humanitarian organisations like Amnesty International, Human Rights Watch and local research centres like Association of Parent of Disappeared Persons and International People’s Tribunal on Human Rights and Justice in Kashmir. The Indian government pays no heed to all these tragic developments. All these problems are direct offshoots of militarism. Today, wars have left every country bereft. It has laden every continent, be it Europe, Latin America, Africa or Asia. In Kashmir, violence has run unabated towards its people as well. Militarism has represented a threat to regional integration and to its ethno national social consciousness. When we go back to the European history, militarism was seen as an instrument of social restructuring, a prerogative to achieve a higher status. In Greece, joining military reflected bravery. British achieved nobility by joining military. The Americans joined military to achieve respect. It was a means for class inflation. Mostly, countrymen joined military due to patriotism, exaltation of military virtues and ideals. However, militarism in the world today has acquired a different meaning. Primacy of nationalism creates an advent of conflicts, and that’s the reason why militarism today is taken in a negative sense. Today, many activists and academia believe that wars are natural consequences of extreme forms of nationalism. Oscar Wilde once called blind nationalism as the trait of the vicious. The lines do hold significance for neo fascist states. It is primarily because of the excesses of human right violations done due to militarism world over. In Kashmir, the fatality figures run into hundreds of thousands which even dispute the official records. These realities have transformed Kashmir into a serious conflict zone. The Indian state has taken Kashmir in a larceny, after it promised a referendum to its people once the provisional accession was signed by Indian authorities with the Maharaja during the partition era. Since then, both countries have installed military establishments, divided our lands, separated families, and have created an ambiance of hostility towards each other. Therefore, militarisation has resulted in adverse effects in Kashmir, just like in other conflict zones. Stockholm International Peace Research Institute (SIPRI) calls India as the largest importer of arms between the year 2007 and 2011. The whole weaponry business has resulted in a thirty seven percent increase. In the next decade itself, the country plans to invest around hundred billion dollars’ worth of weapons. The country is buying arms and ammunitions, improving technology and sharing diplomatic ties with many pivotal defense exporters like United States and Germany. Military strategists are even pressing the governments in power to modernise its army. These initiatives will further rarify the political developments needed for the settlement process. It will even increase the scope of war outbreaks, will further penalise the obedience to UN resolutions, and will neglect peace due to conflicting bilateralism. The vale is already the most militarised zone in the world. People live amongst barbed wires, frisking, bunkers, searches, curfews, and interrogations in a mundane routine. A former princely state, the valley is now coined as a disputed legacy between India and Pakistan, where a resolution seems elusive even after sixty five years. In the troubled times of today, wars against the state have been reduced to innumerable corpses. George Orwell, the eminent British journalist, rightly believed that totalitarianism is a disease to governance. After seeing the illusions of Spanish Civil War, he believed most revolutions to overthrow tyranny have been lost in a desert of immoral consciousness. In India, the role of state has grown inequitably stronger due to nationalistic ideals. 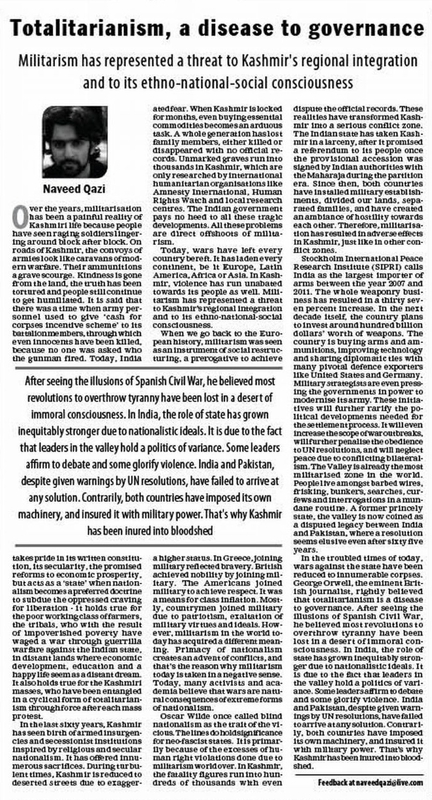 Kashmir is India’s most volatile occupation. It is due to the fact that leaders in the valley hold a politics of variance. Some leaders affirm to debate and some glorify violence. India and Pakistan, despite given warnings by UN resolutions, have failed to arrive at any solution. Contrarily, both countries have imposed its own machinery, and insured it with military power. Kashmir is inured into bloodshed.